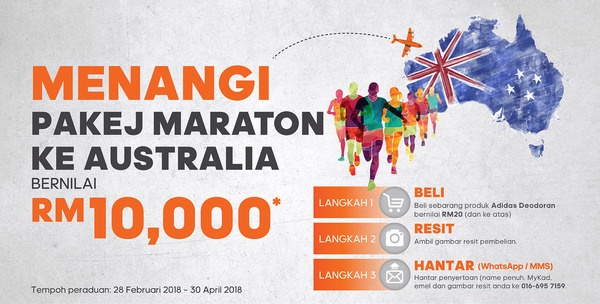 Adidas as strong as I am contest, only spend RM20 on Adidas Deodorant and stand a chance to win Australia Marathon Package worth RM10,000!! Purchase any Adidas Deodorant Product worth RM20 or above. Contestant will receive a reply with a question within 72 hours, answer the question. Adidas cash voucher worth RM250 (from selected Adidas Outlets) x 10 winners. Contestant with the correct answer from WhatApp/MMS questions, with the highest total spending within the contest period will be chosen.